This group was something of an experiment for me. A few local singers had said to me that they would love an opportunity to do something together with their children and that a combined singing group would be great fun. So we gave it a go and ran it between September-November from the Eccles Hotel, Glengarriff. I have to say it was a really lovely group and a great thing to do. We hope to start the group up again after the Easter holidays 2019. Get in touch if you’d like to be a part of it! I have only recently discovered the beautiful venue of Myross Wood and am delighted to be welcomed to hold this event there. As well as a picnic, the day will encompass workshops and the opportunity to hear something of some of the choirs local to the area. This is the first West Cork BIG SING! Singing Picnic and the hope is to hold more in various locations around West Cork…. and further afield. 11am: Tea, coffee and chat about the West Cork BIG SING! project and it’s possible future direction and activities. 12pm: Songwriting workshop, “What singing (and/or being part of a choir) means to me”. 1pm: Singing Circle – a warm up session singing short and easy songs with Jane Goss. 2pm: Picnic – bring a chair, blanket and food and drink to share. Choirs sing! 3.30pm: Singing Workshop – a combination of larger songs from the existing BIG SING! collection plus some new ones with Caz Jeffreys. 5.00pm: Social: A chance to drink tea, chat and to take the time to walk around the grounds, enjoying the beautiful trails before you leave. In the event of bad weather the event will continue with ample sized indoor spaces to meet, sing and picnic together. Children are welcome and parents must take full responsibility for their safety. If you need to bring your dog, please ensure that they are kept on a lead. Had a wonderful day singing with the Transition Year students last week. Such enthusiastic and quick learners. Three songs in between 3-6 part harmonies. They said they’d love to do a flashmob in Cork sometime…we’ll see!! They loved this African song….take a listen! Delighted to have led a session with this gorgeous group of girls for the Convent School, learning a couple of the BIG SING! collection of songs ready for this coming Saturday 7th May at Clonaklty Wellness Week. They were amazing! Looking forwards to singing some more with them soon! Here’s a short video of our short session learning Stand by Me. Great music session on the Cumascu Wellness bus with secondary students from Clonakilty, Bantry, Dunmanway and Schull. Drumming, body percussion, singing, shakin’, guitar playing….they were such an enthusiastic group! Fantastic. Also working alongside WCMHS arts and mental health coordinator Kevin Shanahan and Nick on his music technology and wacky experimental vocals!! Great to be in a team and hope to be doing more of that in the future. The Cumascu bus is getting re-vamped and we will hopefully be able to do more music projects based from it this year. A Right Ol’ Song and Dance! 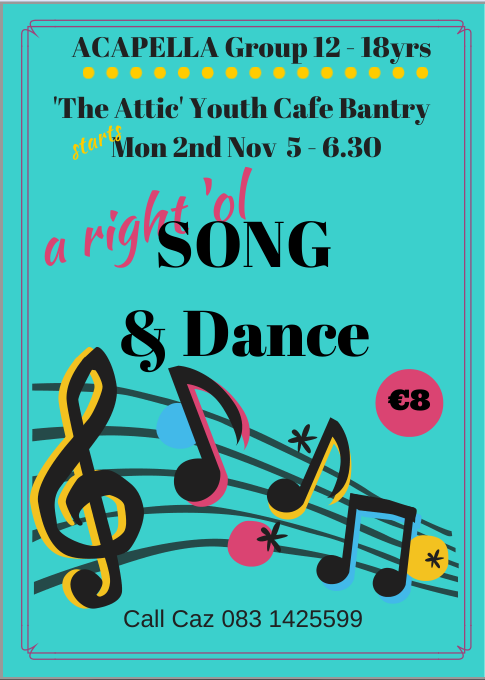 I am starting a new Youth Music project this coming Autumn from The Attic Youth Cafe in Bantry. In this project I aim to provide a sporting and creative environment for 12-18 year olds to explore their voices in Acapella harmony singing. We will be including movement and dance and they will be encouraged to share their own ideas into the content. The group will run on Monday evenings from 5-6.30pm from now up until Xmas, with a view to continuing into the next year. National Choral Singing Week and the West Cork BIG SING! Perhaps you may not be aware that the Association of Irish Choirs in association with Mental Health Ireland promotes 4th-11th October as National Coral Singing Week. All around Ireland choirs will be sharing their songs to promote singing as a positive attribute to mental health. The West Cork BIG SING! includes both individuals and choir members of AOIC and I am delighted to be organising West Corks’ first BIG SING! event in Bantry which I hope will continue on into the future with events involving more choirs as well as members of the public and towns throughout West Cork. If you have a festival or event in aid of mental health, or wish to get involved in any way please do get in touch.